How to build an energy efficient house? We put a lot of emphasis on sustainability in construction nowadays, as it has become increasingly important over the past few years. It is environmentally friendly to maximize energy efficiency in your home and in the long run it also saves us money. But how do we build an energy efficient house? We need to make sure that heat does not escape from the house, as this really is the first step to maximize the energy we put in our houses. We need to insulate our homes to prevent the heat from escaping. Otherwise we just let money fly out of the windows, doors and roof and it is a waste of valuable fossil fuels too. We can save up to a fifth on heating costs by making a relatively easy change, there is no need for a extensive house clearance. Instead we need to consider replacing old aluminum or wooden framesfor something durable and draught free, like recycled upvc plastic frames. The roof is also important if we want to keep a comfortable temperature. In hot countries we find white houses to reflect the heat and light away from the building. In cold countries we find many dark coloured roofs that soak up the heat and send it back throughout the whole house. We also need to keep in mind that the loft space needs to be well insulated, in that manner not all the energy slips straight out of the roof. For these reasons insulation is a vital matter before we even start to think about installing systems like wind turbines or solar panels. The location of our houses can give us valuable clues, with regards to the kind of energy that can be harnessed. We need to maximize the amount of sunlight that we get into our houses, so you should see if large glass windows will work for the house. This is an excellent way of reducing the damage we inflict through our consumption of fossil fuels and also help us reduce our heating bill. 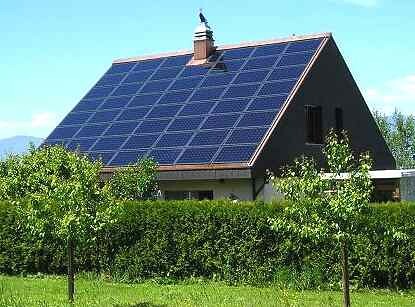 Also solar panels are more popular nowadays. Even in countries where the sun doesn’t shine all the time, it might be good for the wallet to consider solar panels as an option. Panels definitely generate enough solar energy to power up our warm bath. If the house is by the sea or on a hill, the wind is a great natural power to take advantage of. A wind turbine can often be purchased for under £2,500 and even a small one can easily generate enough power for the electronic appliances and the lights. Without having to pay for it and by using a completely natural way of generating power!